Our elementary school librarian is wonderful for many reasons, not the least of which is her immaculate taste in books. So, when I was looking for a children’s book about Albert Einstein to read to my history students, I went directly to her. And, like always, she never ceases to amaze me. 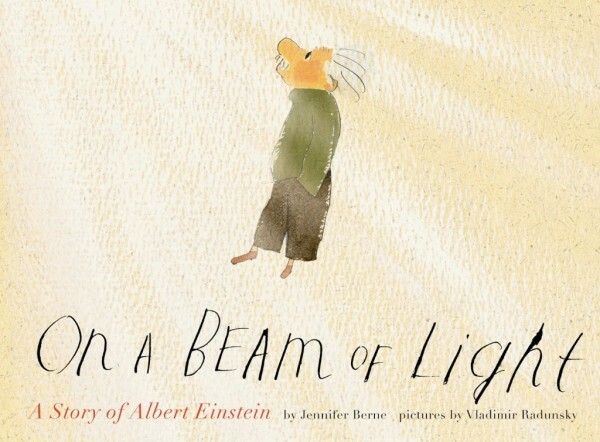 This time, her treasured eye turned me onto Jennifer Berne’s lovely 2013 book, On a Beam of Light: A Story of Albert Einstein. I must admit, what first caught my eye was the name of the illustrator, Vladimir Radunksy, who is one of my all-time favorites. (If you’re not familiar with the wonder of Radunsky, please take a peek at An Edward Lear Alphabet and I Love You Dude – two of his best illustrated works.) So, you have a fabulous illustrator, an equally fabulous author (Jennifer Berne of Manfish: A Story of Jacques Cousteau fame), and a fascinating subject…Add it all together and you’ve got an equation more brilliant than e=mc2. The book details Einstein’s childhood, as a quiet, rather introverted, yet deeply intellectual child who, for years, didn’t say a word. Legend has it his first words were “This soup is too hot!” And when asked by his parents why he didn’t speak before then, he responded, “Everything was fine until now.” With a wonderful attention to quiet details, like his favorite compass and his distaste for socks, On a Beam of Light captures the brilliance of this man while simultaneously making him accessible to a new generation of fans. And it doesn’t pander to children. It doesn’t dumb down the story of this man. Rather, it holds itself up to the standard that Albert himself might demand. And our children are better for it. For to read a special book like this is a gift all itself.